Can you imagine the pressure today’s campaign managers and communication directors face on the road to the White House? In the pre-digital communication era, those jobs were downright easy compared to the 24/7 news cycles of today. Plus, good news and bad news alike have the potential to go viral, and if your media intelligence isn’t up to snuff, you could wind up missing out on great opportunities to raise money—or worse, be forced into damage control mode, over and over again. Monitoring and analyzing the media proactively enables you to gain insights sooner so you can stay on top of issues that bubbled up. Take two topics that have been dominating social media feeds in the past week: a little bird that landed on a podium at one campaign stop and an incident between a reporter and campaign manager at another. 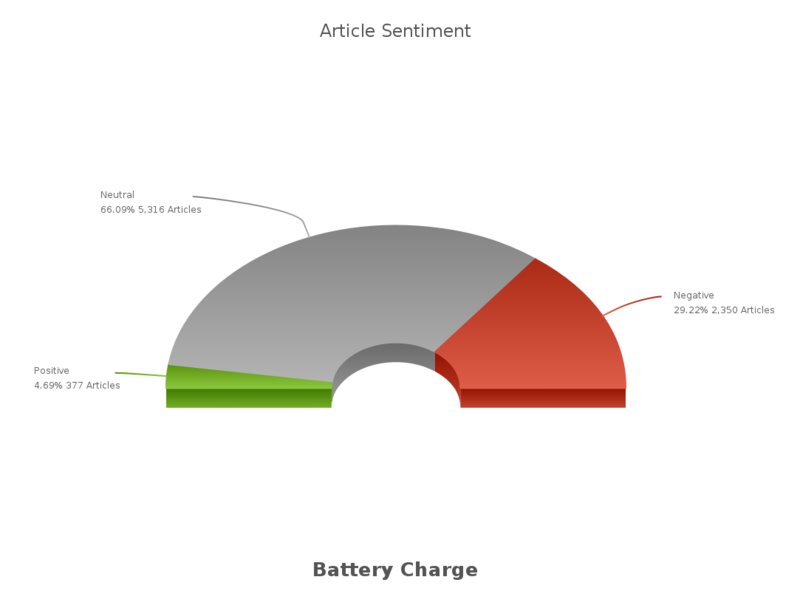 As you can see from the article sentiment below—and as you might have guessed from the topics themselves—article sentiment varies widely between positive and negative. The Sanders campaign is capitalizing on the new #BirdieSanders hashtag, which in less than 7 days has eclipsed others used by the campaign including the long-standing #FeelTheBern. 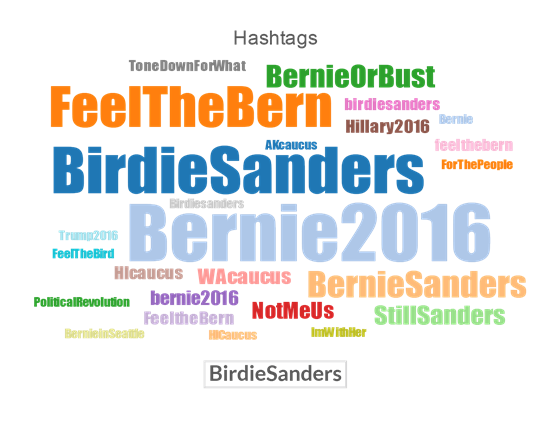 Bumper stickers and t-shirts featuring an adorable ‘Bernie bird’ are generating donations. See other advantages of media monitoring and analysis. Meanwhile, the Trump campaign is struggling to get past news coverage of its own campaign manager’s recent arrest on a misdemeanor assault charge and the subsequent media scrutiny deeper into his background. 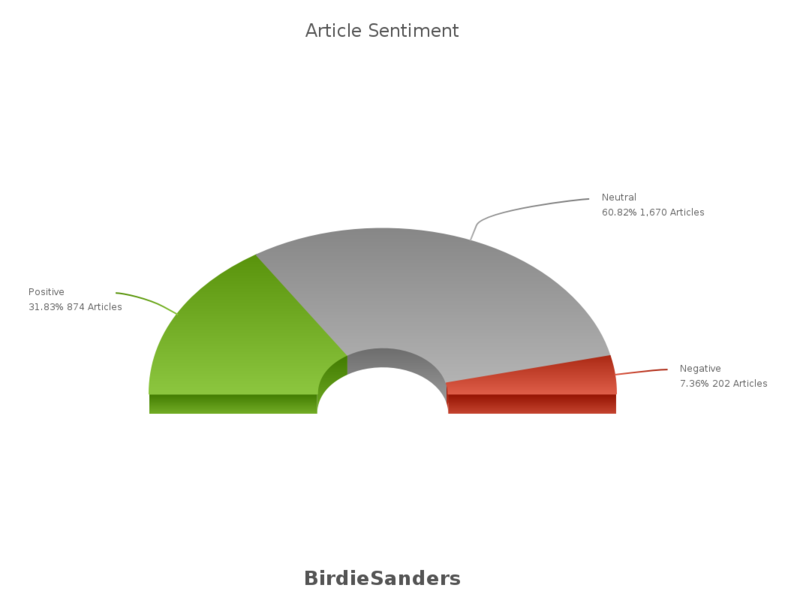 What makes matters worse—the media loves a scandal, so the topic is receiving far more coverage than #BirdieSanders, except in the micro-blog space. Until recently, most of the candidates have been pretty light on details when it comes to policies, but as the field narrows, both Democrat and Republican hopefuls are clarifying their positions on a number of issues. As you can see from the Article Volume chart above, the hot topics remain consistent, but the coverage of those topics shifts. 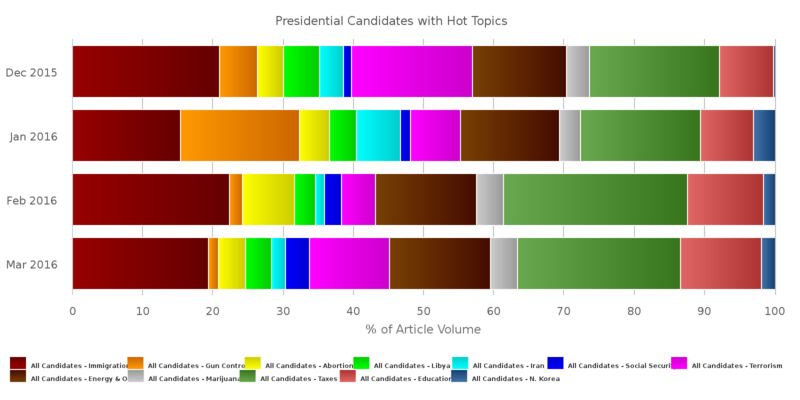 By tracking and analyzing media coverage, candidates can fine-tune their messaging for the broadest appeal based on situations of the day. And, of course, companies can improve awareness into emerging trends in the same way. 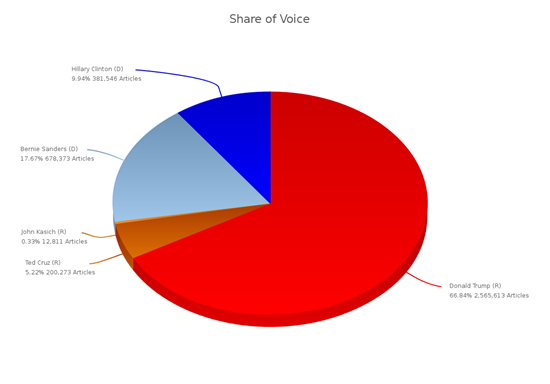 Whether you’re a presidential campaign communication director or a PR or marketing professional, you want to understand just where you stand in terms of Share of Voice versus competitors. Not only is it critical for your efforts to attract and maintain the attention of voters—and customers—but it also enables you to allocate your budget to capitalize on the ‘free’ attention you’re getting, or if needed, to redirect the focus of your audience away from the negative. You don’t need to be marching down a campaign trail to recognize that media intelligence helps you stay agile. Success is a moving target, and yet media monitoring enables you to always keep an eye on the prize—whether that’s new digs in Washington D.C. come January or winning new customers to fuel business growth. 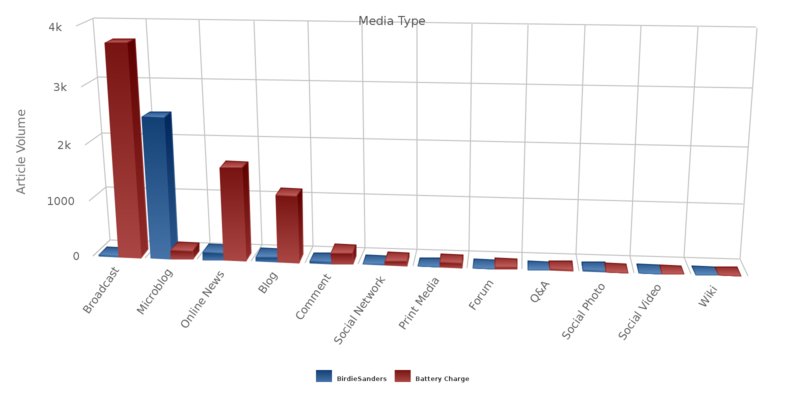 Check out our U.S. Presidential Campaign Tracker to keep tabs on what’s being said in the media. Register for a free trial of LexisNexis Newsdesk™ media monitoring to experience it for yourself.